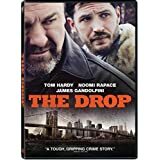 The Drop is one of those films that might have escaped you had it not been James Gandolini's final appearance in a film. It is a rare crime story, more about a neighborhood and its past than it is about an actual crime. There are gangsters and all the likely ingredients for a film about crime, but the characters and the acting are what should draw you to this film. Tom Hardy plays Bob Saginowski, a peaceful bartender that seems to live an uneventful life since working for his cousins bar who used to be a connected guy, Marvin played by Gandolfini. Marvin "Marv" ceded ownership of his bar to Chechen gangsters who still use his place for money drops. Both Marv and Bob seem a bit sentimental for the old days, but Bob is more accepting of his new role in their Brooklyn neighborhood where everything takes place. The bar Bob and Marv work in gets robbed and that pretty much put things in motion in the film that will tie events together making some of the reactions from the old days become necessary. The acting from Hardy and Gandolfini is superb in that you really sympathize with Bob, and Marv seems like someone you may have encountered if you have ever been in a bar in Brooklyn. Interestingly enough, the gentrified Brooklyn people know today is the what is not present in the film but referenced a lot in the dialogue. Bob and Marv are from that time and while it may not seem like it a first, Bob is an adaptive creature and it comes out at one of the films high points. The film is rated 'R' for violence and language, if you're looking for a quiet little gangster film The Drop will deliver.